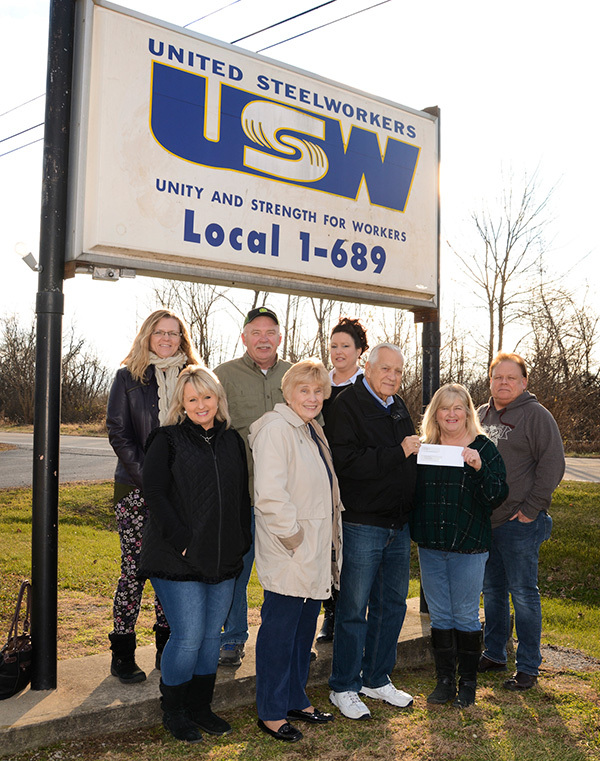 PIKETON, Ohio – On Dec. 14, United Steelworkers’ (USW) Local 1-689 Women of Steel donated $400 to the Cornerstone United Methodist Church Food Pantry in Portsmouth, Ohio. Approximately 160 people a month are given food from the pantry’s shelves. Shown at the donation from the USW Women of Steel of Piketon to the Cornerstone United Methodist Church Food Pantry are, from left, Andria Smalley, Theresa Workman, Lou Thompson, Becky Wood (of the food pantry program), Jodi Jenkins, John Wood (of the food pantry program), Francie Mullins and Mark Veach. Not pictured, Lisa Jenkins, Brook Pyle, Melissa Sammons, Sandy Stanley and Jeri Trent. During the previous month, members of the Women of Steel collected donations from employees of the former Portsmouth Gaseous Diffusion Plant during a “bucket drive” held at the site. Close to 2,000 workers are employed at the Department of Energy’s (DOE) site in Piketon, and approximately 800 employees are members of the USW. The USW Women of Steel is an arm of the United Steelworkers union, the largest industrial union in the United States. For more information, visit http://www.usw.org. Volunteers John and Becky Wood, who coordinate and distribute the food, are grateful for the contribution. The pantry, which was formed in 2011, began operating its facility at 808 Offnere Street in Portsmouth. Once a month, volunteers there distribute some of life’s necessities to the needy. Approximately 25 volunteers and community service workers staff the pantry. Recipients from the local neighborhood and throughout Scioto County receive food from the pantry.